Broadway's The 39 Steps sends up just about every movie in the Hitchcock catalog. I'll be speaking Tuesday, September 1 after the show. If you're in NYC, drop on by! Alfred Hitchcock’s plots don’t always make much sense, following, as they often do, the lucidly contorted logic of a fever dream. 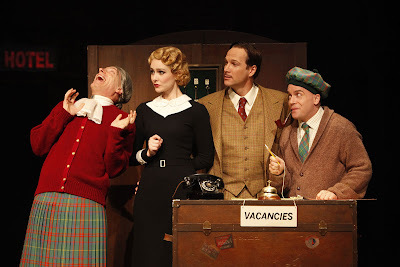 Yesterday, I described The 39 Steps as the "sum of all Buchan's and Hitchcock's worst fears." Watch it again, and you’ll agree that it's an end-to-end nightmare, complete with a scene in which the hero must participate in that most common of nightmare scenarios: unprepped public speaking. This scene provided some good comic relief at a point in the movie when tensions were running high. It also made a timely political statement. In 1935, Europe was in a tense mood, and his speech called for peace when so many were speaking of war. For me, it’s also one of the most touching scenes in the movie. Richard Hannay had spent four days running for his life, begging for help from anyone who would listen. At this point, his resources seemed dried up, with a noose winding inexorably around him. He had nowhere else to run or hide. In fact, the police were waiting in the wings to handcuff him the moment he left the stage. Under these conditions, he offered up an eloquent cry for peace and understanding—for himself and for all other people who were caught up at that time in the international conspiracies that eventually brought about World War II. In Hannay's brief turn as an impromptu orator, life is but a (celluloid) dream. EMCEE: Ladies and gentlemen, I'm now going to call upon the speaker of the evening. EMCEE: There's no need to say who he is or to speak of his brilliant record as a soldier and a statesman. He's a son of Scotland who has crossed the border and conquered England. He is now one of the foremost figures in the diplomatic political world in the great city of London. I'm, therefore, going to ask him to tell you something. AUDIENCE MEMBER: It's about time, too. EMCEE: How important it is to this constituency that at this crucial by-election our candidate should be returned by an adequate majority. I now ask for Captain Fraser. and Scottish muscle — that is to say, on that journey I had no idea that in a few days time I should find myself addressing an important political meeting. I had planned a very different program for myself. A very different program. You'd be for the moors to shoot something. Or somebody. I'm a rotten shot. Anyhow, I little thought I should be speaking tonight in support of that brilliant, young statesman. The gentleman on my right, already known among you as one destined to make no uncertain mark in politics. In other words, your future member of Parliament, your candidate, (failing to properly read the candidate’s name on a nearby sign) Mr. McCrocodile. AUDIENCE MEMBER: He doesn't know the candidate's name. by which he's already known in anticipation, mark you, at Westminster. Now, ladies and gentlemen, we'll discuss some topic. What shall it be? AUDIENCE MEMBER: The herring fisheries! AUDIENCE MEMBER: What about the idle rich? All eyes are on Hannay as he nervously makes the best of his nightmare. this world a happier place to live in. A world where no nation plots against nation, where no neighbor plots against neighbor where there is no persecution or hunting down, where everybody gets a square deal and a sporting chance, and where people try to help and not to hinder. A world from which suspicion and cruelty, and fear have been forever banished. That is the sort of world I want! Is that the sort of world you want? Fine! That's all I have to say. Good night! Hannay reaches the climax of his impromptu speech. HANNAY (To the next speaker): I kept them going as long as I could. POLICE OFFICER: You're a difficult man to follow. This scene has it all: Pitch-perfect comedy. An impassioned call for peace and common sense in a world that offered little of either. And a last-ditch cry for help from a hunted man who was lonely, scared and tired of running—and for whom time was running out. In other words, it is Richard Hannay’s finest moment. Though to a much lesser degree, I’ve been in tough spots like that myself. So, probably, have you. A tip of the hat to Hitchcock for his powerful, nuanced depiction of these ideas. Hitchcock...because I ‘am giving away several items on me blog this month in honor of his birthday which was on August 13, 2009. By the way, Thanks, for the link on your blog roll too! Hi Dee Dee! Thanks for sropping by and for the well-wishing!